If lounge rooms were designed by kids, there would be no furniture, just floors covered in the electric bright cushions by Kip & Co.
We’ve spent plenty of time drooling over Kip & Co’s textiles. This is a company whose bright prints are irresistible. 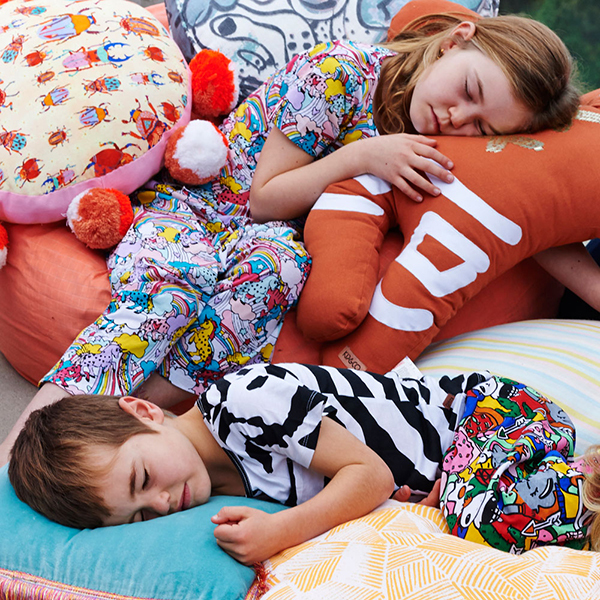 From colourful swaddling wraps to cosy quilted blankets, vivid pyjamas to soft cushions, Kip & Co can make any lover of neutrals come over to the bright side. The huge Rainbow Cushion ($89) with its googly eyes and smile is sure to lure the most resistant toddler to dreamland. If your baby is too young for pillows in bed, this shape is just right for tummy time or to use as a breastfeeding support. 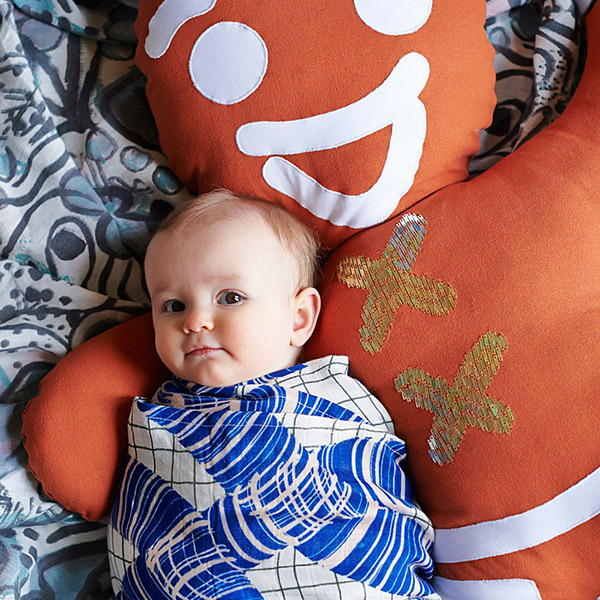 Although it’s mainly brown and white, designers couldn’t resist adding colour to the gigantic, goofily grinning Gingerbread Cushion ($89): the crosses are embroidered in multi-coloured thread. Between the gorgeous beetle print by Brooklyn designer Caroline Kaufman and the giant orange and white pom poms, the Beetles Pom Pom Cushion makes a beautiful floor cushion or landing pad for epic leaps off the lounge on rainy days. Kip & Co cushions are available on their website, but beware. You’ll go for the cushions and end up staying for the blankets and pyjamas and quilt covers – better take a cup of tea with you!